Our client, Brian, was injured in a high-speed, multi-vehicle collision on Interstate 5 in 2009 that occurred when one driver rear-ended another and caused that vehicle to crash into our client. 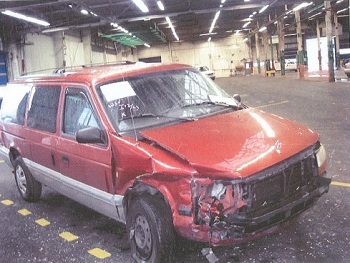 According to a Washington State Patrol (WSP) investigation, Brian was traveling on I-5 just south of the Roanoke St. exit when one driver rear-ended another vehicle that had slowed down for approaching traffic. That collision sent the second vehicle across the roadway, where it collided with a third vehicle before crashing into Brian’s car. As a result of the collision, Brian suffered significant injuries to his right shoulder, neck, and right knee. He was also diagnosed with a head injury and slipped disc in his lower back, which caused chronic pain and numbness in his lower back and legs. Doctors believed that surgery might alleviate the pain in Brian’s legs, but that it was unlikely to resolve the chronic back pain he had experienced since the accident. Because the chances of success were slim, doctors opted not to perform the surgical procedure on our client’s back, leaving him to deal with the pain. After reading attorney Chris Davis’ book, The Ten Biggest Mistakes That Can Wreck Your Washington Accident Case, Brian decided to hire Mr. Davis to represent him in a personal injury claim against the at-fault driver’s insurance company. Before hiring Davis Law Group, Brian had a hard time dealing with the insurance adjuster who was representing the at-fault driver. The insurance company even tried to claim that Brian’s injuries were actually preexisting conditions, rather than being a result of the accident. After several years of ongoing medical treatment and negotiation with the insurance company, the insurance company decided it was in their best interests to settle the case. Brian’s healthcare costs totaled over $25,000 as a result of the various medical treatment he received for his injuries. In the end, attorney Chris Davis was able to recover a $150,000 settlement for Brian and his family. Brian was injured in a collision on I-5 at approximately 60 mph after one driver rear-ended another, causing the second vehicle to crash into our client's car. Attorney Chris Davis negotiated a $150,000 settlement for Brian and his family.